Sacramento Southern Railroad Trains depart from the Central Pacific Freight Depot in Old Sacramento located at Front & "K" Streets. 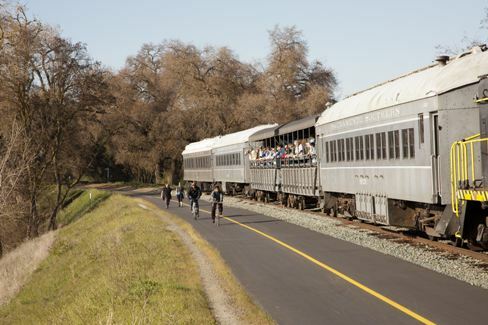 Excursion trains run weekends April through September, departures on the hour 11 a.m. to 5 p.m.
Take Interstate Highway 80-East to West Sacramento. At the I-80/Business 80 split, follow Business 80 to Downtown Sacramento, then as the freeway climbs up over the Sacramento River, take the Interstate Highway 5-North exit. Exit at "J" Street (a one-way, eastbound street) and go two blocks to Fifth Street. Turn left, then turn left again at "I" Street. Follow the large overhead signs to "Old Sacramento/Railroad Museum." Take Highway 99-North to Sacramento. Follow Highway 99 through two freeway intersections in Sacramento (Highway 99/Highway 50/Business 80, then Business 80/Highway 99/Interstate Highway 5). You will end up headed north on Interstate Highway 5/Highway 99 in downtown Sacramento. Exit at "J" Street (a one-way, eastbound street) and go two blocks to Fifth Street. Turn left, then turn left again at "I" Street. Follow the large overhead signs to "Old Sacramento/Railroad Museum." Take Interstate Highway 80-West to Interstate Highway 5-South. Follow I-5 south to downtown Sacramento. Exit at "J" Street (a one-way, eastbound stree t) and go two blocks to Fifth Street. Turn left, then turn left again at "I" Street. Follow the large overhead signs to "Old Sacramento/Railroad Museum." Take Highway 50-West to Sacramento. Continue west on Highway 50/Business 80 to Interstate Highway 5-North and downtown Sacramento. Almost as soon as you join I-5, you will be exiting. Exit at "J" Street (a one-way, eastbound street) and go two blocks to Fifth Street. Turn left, then turn left again at "I" Street. Follow the large overhead signs to "Old Sacramento/Railroad Museum." Head south on Highway 99 or Interstate Highway 5 to Sacramento. The two highways join together just a few miles north of Sacramento, near Sacramento International Airport. Continue south to downtown Sacramento. Exit at "J" Street (a one-way, eastbound street) and go two blocks to Fifth Street. Turn left, then turn left again at "I" Street. Follow the large overhead signs to "Old Sacramento/Railroad Museum." On-street, metered parking in Old Sacramento is for short durations only (90 minutes maximum) and the limited amount of spaces generally fill up early. Thus, we recommend instead that guests utilize the public parking garages located at either end of Old Sacramento. Nominal hourly and daily rates are available, and you won"t have to worry about moving the car when your meter runs out. Parking validations are available from a variety of Old Sacramento restaurants and merchants to help make your parking expenses even more reasonable. Although the California State Railroad Museum does not offer parking validations, we keep a list of participating merchants at our Front Desk which you may look over during your visit. 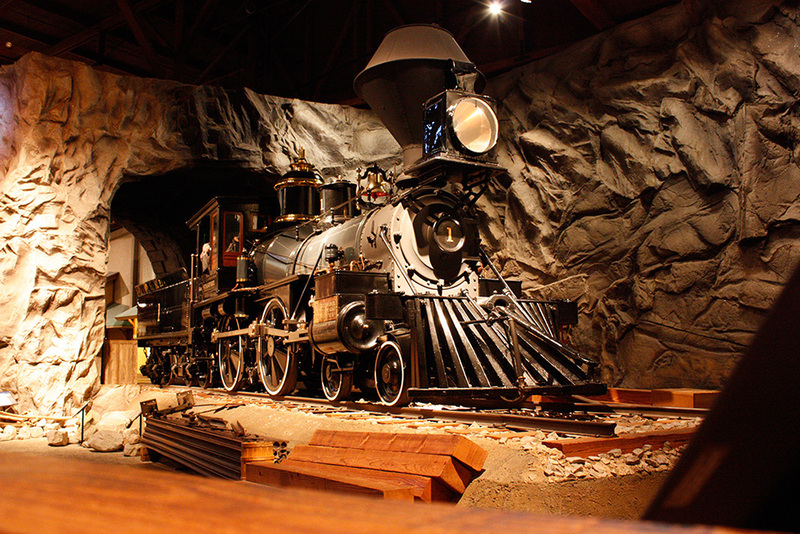 The California State Railroad Museum (CSRM) in Old Sacramento is the world-class tribute to the role of the "iron horse" in connecting California to the rest of the nation. 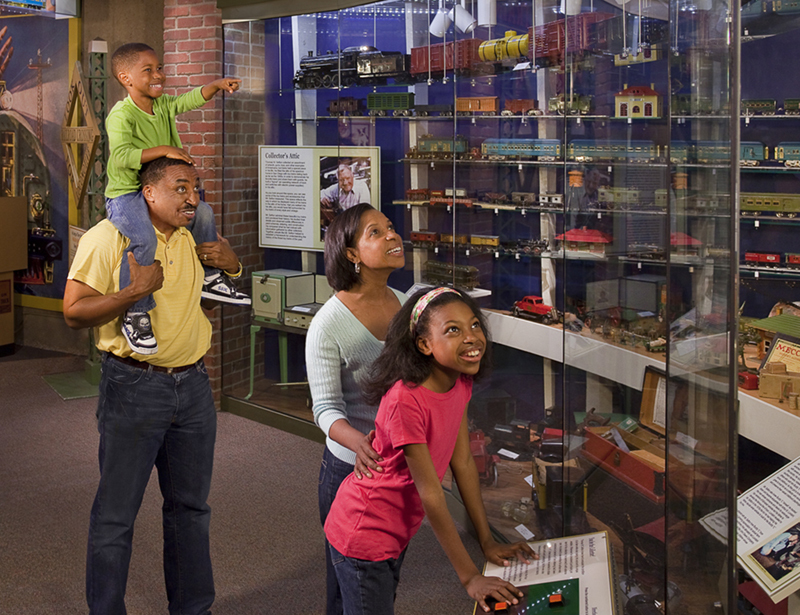 Our museum features 21 lavishly restored locomotives and cars, some dating back to 1862. 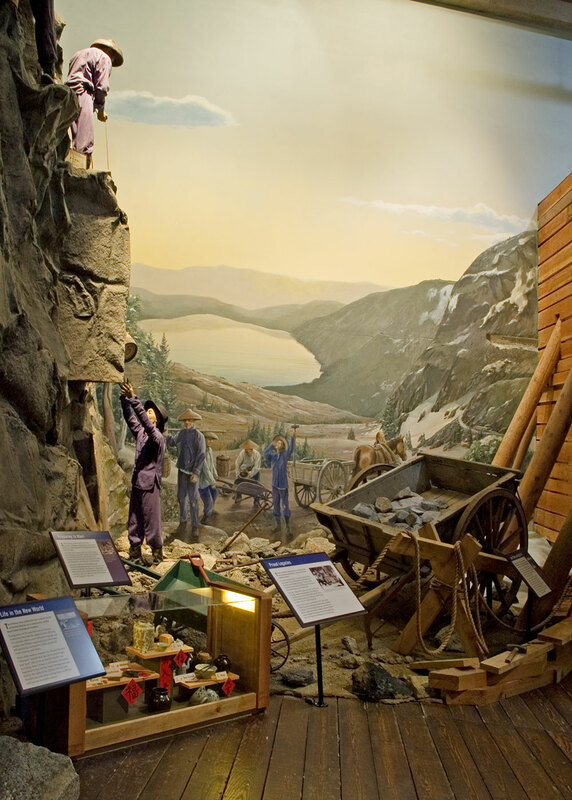 There is a full-scale diorama of an 1860s construction site high in the Sierra Nevada as well as a bridge elevated 24 feet above the museum floor. California State Railroad Museum Excursion Trains run from April through September (select dates October through December), where you can take a ride behind an authentic locomotive in Old Sacramento. When you climb aboard the Museum’s Sacramento Southern Railroad you enjoy a relaxing 45-minute, 6-mile roundtrip ride along the levees of the Sacramento River. Experience the sights, smells, and sounds of a real, working locomotive as it pulls vintage passenger coaches and converted freight cars. Excursion Trains depart Saturdays and Sundays, on-the-hour 11 a.m. to 4 p.m., from our reconstructed Central Pacific Freight Depot. 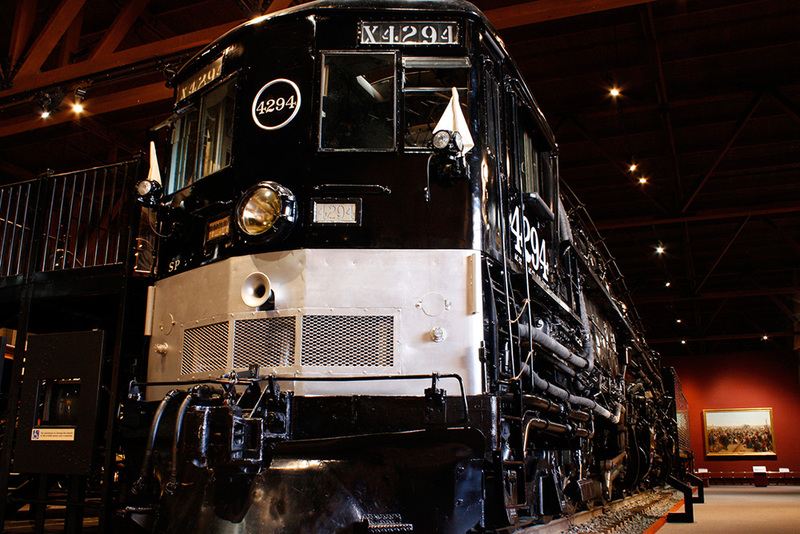 2015 is the 32th year the State Railroad Museum has operated our excursion trains. 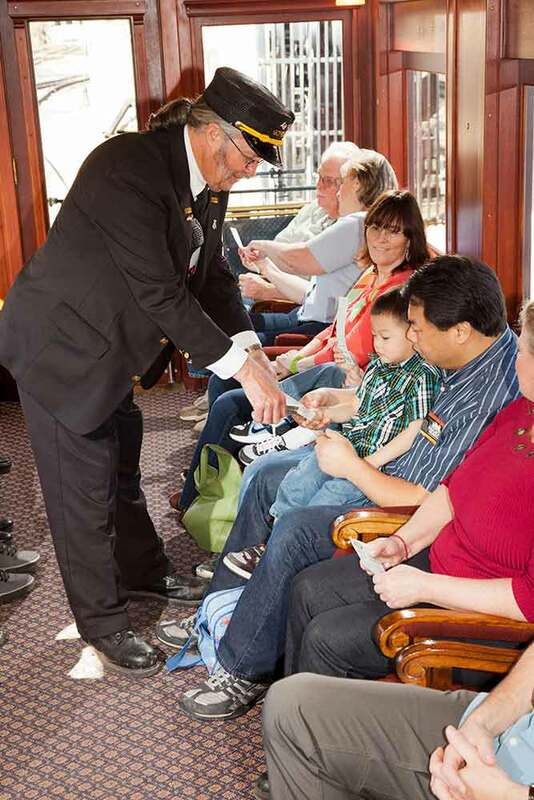 Excursion train tickets are $12 adults, $6 youths (ages 6-17), ages 5 and under ride free. For more information call (916) 323-9280. The California State Railroad Museum is located in Old Sacramento at 125 "I" Street. On-street, metered parking in Old Sacramento is for short durations only (90 minutes maximum) and the limited amount of spaces generally fill up early. Thus, we recommend instead that guests utilize the public parking garage located at the north ("I" Street) entrance to Old Sacramento. We welcome photography for personal use. Handheld flash is allowed; however tripods and free standing flash are not permitted for safety reasons.